This is the car that Jack glimpsed in a barn as he strolled along a Kentish bridleway, and its story is told in Classic in the Barn. The British Lagonda company won its attractive name from a creek near the home of its American-born founder Wilbur Gunn in Springfield, Ohio. The name given to it by the American Indians was Ough Ohonda. 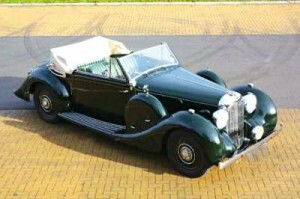 The V-12 drophead was a car to compete with the very best in the world, with a sporting 12 cylinder engine which would power the two 1939 Le Mans cars. Its designer was the famous W.O. Bentley. Sadly many fine prewar saloons have been cut down to look like Le Mans replicas. The V12 cars are very similar externally to the earlier 6-cylinder versions; both types were available with open or closed bodywork in a number of different styles. This entry was posted in The Colby Cars and tagged Classic in the Barn. Bookmark the permalink.